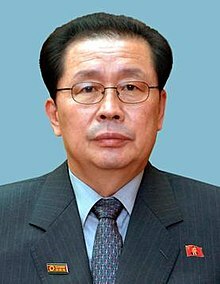 Jang Song-thaek (Korean: [tɕaŋ sʌŋ.tʰɛk]; also romanized as Jang Sung-taek, Chang Sŏng-t'aek and other variations; January or February 1946 – 12 December 2013) was a leading figure in the government of North Korea. He was married to Kim Kyong-hui, the only daughter of North Korean President Kim Il-sung, and only sister of North Korean General Secretary Kim Jong-il. He was therefore the uncle-in-law of current leader of North Korea, Kim Jong-un. Although the precise extent of Jang Song-thaek's power and position during his life cannot be confirmed, in 2008 South Korean government officials and academic North Korea experts suggested that he had taken on de facto leadership over North Korea while Kim Jong-il's health was declining and when Kim subsequently died. Jang was vice-chairman of the National Defence Commission, a position considered second only to that of the Supreme Leader. He is believed to have been promoted to four-star general around the time of Kim Jong-il's death as his first appearance in uniform was while visiting Kim lying in state. Jang was considered a "key policy adviser" to Kim Jong-un. In December 2013, Jang was abruptly accused of being a counter-revolutionary and was stripped of all his posts and expelled from the Workers' Party of Korea (WPK). His photos were removed from official media and his image digitally removed from photos with other North Korean leaders. On 13 December, North Korea state media announced he had been executed. There have been external reports that many members of his family have also been killed. Jang was born in Chongjin, during the Soviet Civil Administration of Northern Korea. He graduated from the Kim Il-sung Senior High School before leaving for Moscow, where he studied at Moscow State University between 1968 and 1972. Following his return, he married Kim Kyong-hui, the younger (and only) sister of Kim Jong-il. The couple had a daughter, Jang Kum-song (1977–2006), who lived in Paris as an international student; she refused an order to return to Pyongyang and then reportedly committed suicide in September 2006, due to Jang and his wife's opposition to her relationship with her boyfriend. Kim Kyong-hui was reported executed by poison in May 2014 because she complained about her husband's execution. Beginning in the 1970s, Jang held a series of positions in the Workers' Party of Korea. His first post was as an instructor for the Pyongyang City Committee of the Workers' Party. In the late 1970s, however Jang's career stalled when he was sent away from the central party to be manager of a steel and ironworks in Nampo, an apparent demotion. Reports said that he was becoming too powerful or, according to other accounts, he had an over-ostentatious lifestyle. It was reported that Jang suffered severe burns in an industrial accident at the factory in Chollima/Kangson. His career recovered and he became deputy director of the Youth Work Department of the KWP Central Committee in 1982 and director in 1985. He was first elected to the Supreme People's Assembly (SPA), North Korea's nominal parliament, in 1986. In April 1989, Jang was made a People's Hero; in June 1989, he was elected an alternate member of the Central Committee of the Workers' Party of Korea. In April 1992, He was named a member of the Order of Kim Il-sung. Later that year he was promoted to full member of the Central Committee. He was a member of the funeral committee for Kim Il-sung in 1994. Jang was appointed to be the first deputy director (or vice director) of the WPK's Organization and Guidance Department in November 1995. He had been identified by outside analysts as well as North Korean defector Hwang Jang-yop as a possible successor to Kim Jong-il; however, on 25 November 2004, South Korea's National Assembly heard testimony that he had been purged from his position. Some South Korean intelligence reports indicated that Jang was under house arrest in Pyongyang, while others suggested he might have been sent for "reeducation". Jang re-emerged in March 2006, accompanying Kim Jong-il on an official visit to China. In October 2007, the Korean Central News Agency confirmed that Jang had been promoted to the newly recreated post of first vice-director of the Workers' Party of Korea, with oversight responsibility for the police, judiciary, and other areas of internal security; Jang attended South Korean president Roh Moo-hyun's luncheon during the latter's visit to the North. It was later revealed that Jang had been actually appointed director of the Administration Department, an old agency of the Workers' Party abolished in 1990 and re-created by splitting the Organization Department. He was elected to the National Defence Commission in April 2009. He was made vice-chairman of the commission in summer 2010. During this period he was a close ally of Kim Jong-il. Jang was still in the post four years later, in April 2013. The NDC is North Korea's de facto supreme decision-making body; Jang's promotion made him a key executive deputy, second only to Kim Jong-il. It is speculated that the move was part of posturing to make Kim Jong-il's son Kim Jong-un the next leader of North Korea. Jang's position in North Korean politics was also ostensibly boosted by the death of Ri Je-gang, a senior leader who was tipped by Kim Jong-il as a crucial overseer of the succession campaign. On 25 December 2011, North Korean television Sunday showed Jang in the uniform of a general. A Seoul official familiar with North Korea affairs said it was the first time Jang has been shown on state television in a military uniform. His appearance suggested that Jang had secured a key role in the North's military, which had pledged its allegiance to Kim Jong-un. Jang's importance continued to be demonstrated during his 2012 visit to China: various aspects of the visit echoed protocol which had previously been followed only for Kim Jong-il, including half of his entourage arriving ahead of time as an advance party, with the Chinese ambassador to North Korea, Liu Hongcai, returning to China beforehand to greet Jang upon his arrival. On 17 August 2012, Jang met with China's premier, Wen Jiabao in Ziguangge, Zhongnanhai. He met with Hu Jintao, General Secretary of the Communist Party of China, Wang Jiarui, head of China's international department of the CPC central committee and minister in charge of the national development and reform commission, Zhang Ping, minister of finance Xie Xuren, minister of commerce Chen Deming, Liaoning provincial Party Committee Secretary Wang Min, Jilin provincial Party Committee Secretary Sun Zhengcai, and vice foreign minister Zhang Zhijun. He was the head of a delegation of the joint steering committee for developing and managing the Rason Economic and Trade Zone and the Hwanggumpyong and Wihwa Islands Economic Zone. In the announcement, he was listed as chief of the central administrative department of the Workers' Party of Korea, a member of the WPK political bureau, and vice-chairman of the National Defense Commission. Jang said Kim Jong-un believed that bilateral relations with China are important and that the "profound friendship will be passed on from generation to generation" between China and North Korea. At the meeting with Wen, Jang said: "The DPRK is willing to closely cooperate with China to accelerate relevant efforts and push forward cooperation in developing economic zones." On 4 November 2012, the WPK Central Committee Politburo established a new State Physical Culture and Sports Guidance Commission, appointing Jang as its first chairman. An analyst suggests that this quiet promotion may have signaled a decline in Jang's status: in North Korea, "although sports can bring quick popularity, earn foreign exchange, raise patriotic fever, and help burn the energies of the youth and distract the masses from their daily hardships, it can never beat national security and socio-economic development in terms of its political significance. By asking Jang to chair the National Sports Commission, the young North Korean leader, less than a year into power, might have begun to nudge his uncle out of important policy deliberations." In January 2013, speculation arose that Jang had been quietly promoted to top decision-making Politburo Presidium member, as his official hierarchy position was elevated, displacing then-Chief of General Staff Hyon Yong-chol and his own wife Kim Kyong-hui. An analyst argued that Jang might be appointed chairman of the presidium of the Supreme People's Assembly (making him the nominal head of state of the DPRK) or Premier of North Korea, replacing officeholders who were in their 80s. Jang Song-thaek promoted the construction of a new bridge over the Yalu River between the Chinese city of Dandong and the Korean city of Sinuiju. As of December 2013[update], the bridge was nearly completed. That same month, Jang was not invited to the meeting of top North Korean officials handling national security and foreign affairs, following a rocket launch on 12 December 2012, and new international sanctions in response. Following Jang's fall from power, an analyst noted that Jang's "glaring absence" at the January 2013 meeting "signaled the emergence of a possible crack in the senior leadership, especially in the relationship between Kim and his all-powerful uncle, raising the possibility of divergent approaches between Kim and Jang" on North Korea foreign policy. In late May 2013, Choe Ryong-hae, a vice-chairman of Central Military Commission and director of the KPA General Political Department, was sent as Kim Jong-un's first special envoy to China, passing over Jang. An analyst viewed this as a "striking" choice, and noted that "it appears that as the perceived 'China man in Pyongyang'", Jang's "perceived close ties with China may have done a disservice to his standing in the eyes of Kim, exposed him to criticism of being too subservient to China, and made him vulnerable to any anti-China backlash in Pyongyang". Thought to have been particularly unacceptable to Kim Jong-un were Jang's "continued expression of sympathy towards" Kim Jong-nam—Kim Jong-un's half-brother and Kim Jong-il's eldest son—who was living in exile under Chinese protection at the time. According to the New York Times, the final straw came from a dispute over control of North Korea's west coast fisheries. These had been partly taken from the military by Kim Jong-un in 2011, but later this decision was reversed and the fisheries were ordered returned to the military. Forces loyal to Jang defied the transfer, leading to a confrontation in late 2013, in which several North Korean soldiers loyal to Kim Jong-un were killed. Subsequent reinforcements sent by Kim Jong-un seized control of the fisheries. Soon after, in November 2013, Jang's senior aides Lee Yong-ha and Jang Soo-kee were executed. Lee was reportedly accused of abusing his authority, while Jang Soo-kee was found guilty of trying to organize a new faction and rejecting the system. Jang had not been seen in public since. On 3 December he was dismissed from his post. On 7 December, his appearances were obscured or edited out from a news report (originally aired in October) that re-aired on Korean Central Television. On 8 December, Jang Song-thaek was publicly expelled from the ruling Workers' Party of Korea (WPK), with state media attributing this to a decision of the Politburo. Jang was accused of having committed "anti-party, counter-revolutionary factional acts" that included illicit affairs with women; harboring "politically-motivated ambition"; weakening "the party's guidance over judicial, prosecution and people's security bodies" and obstructing "the nation's economic affairs". Jang's arrest at a politburo meeting was broadcast on Korean Central Television, the state television broadcaster, in "the most public dismissal... in history" of a prominent North Korean official, and the first time since the 1970s that a senior politician was arrested in a party meeting on live television. Wen Wei Po reported that Lee Yun-keol (the chairman for the Seoul-based North Korea Strategy Information Service Center) stated that Kim Jong-chul (Kim Jong-un's elder brother) had personally led his guards to arrest Jang. Lee said that "even Vice Marshal Choe Ryong-hae would not dare to carry out the arrest" himself (some analysts believe this may signal an expanded role for Kim Jong-chul in the regime). A 2700-word statement was released, stating that the "despicable human scum Jang, who was worse than a dog, perpetrated thrice-cursed acts of treachery in betrayal of such profound trust and warmest paternal love shown by the party and the leader for him". The statement detailed many charges against Jang, stating that he "had desperately worked for years to destabilize and bring down the DPRK and grab the supreme power of the party and state by employing all the most cunning and sinister means and methods". The statement accused Jang of freeing "the undesirable and alien elements, including those who had been dismissed and relieved of their posts after being severely punished for disobeying the instructions of Kim Jong Il and "let them work in the WPK CC [Korean Workers' Party Central Committee] Administrative Department and organs under it in a crafty manner", which some analysts claim indicates that Jang had instigated a nationwide amnesty in January 2012 which included the closure of several North Korea prison camps and the release of prisoners. An analyst suggested that "since most of the political prisoners freed at that time are now deemed as Jang's factionists, most of them are likely to be returned to jail again". The statement accused Jang of bringing "serious harm to the youth movement in the DPRK, being part of the group of renegades and traitors in the field of youth work, bribed by the enemies". An analyst believes that Choe Ryong-hae, "the party-appointed shepherd of the North Korean youth for over a decade" through his position in the Kim Il-sung Socialist Youth League, linked Jang to this crime. The statement accused Jang of seeking to enlarge his own power, "stretching his tentacles to all ministries and national institutions" and turning the Korean Workers' Party Central Committee Administration Department, which Jang led, into a "little kingdom which no one dares touch"; Kim Jong-un disbanded the Administrative Department after Jang's fall. The statement also said that Jang had "systematically denied the party line and policies, its organizational will" as if he were "a special being who could overrule either issues decided by the party or its line" and that Jang had been "disobeying the order of the Supreme Commander of the KPA" (i.e. undermining Kim's rule). He was also accused of undermining the Kim personality cult, which included placing a granite monument carved with the supreme leader's words "in a shaded corner"; letting "the decadent capitalist lifestyle find its way to our society by distributing all sorts of pornographic pictures among his confidants"; and "half-heartedly clapping, touching off towering resentment of our service personnel and people" when one of Kim Jong-un's promotions was announced. On 12 December 2013, Jang was tried by a special military tribunal of the Ministry of State Security and executed, according to state media. Chinese media and North Korea experts suggested that Jang Song-thaek's fall reflected a rejection of his efforts to prioritize economic development, and a victory for North Korean advocates of a military-first policy. Chang Yong-seok, senior researcher at the Institute for Peace and Unification Studies at Seoul National University, said Jang was "the only one in the North who could talk about economic change. So, when I heard of Mr. Jang's execution, my first thought was that it was a death notice for those of us who have hoped for economic reform in the North." Analysts of North Korean politics agreed that Jang's execution was the most significant since purges carried out in the 1950s by Kim Il-Sung, Kim Jong-un's grandfather and North Korea's founder; since 1960, purged top officials have not usually been killed, and the denunciations of purged figures have not typically been so extreme and public. Professor Charles K. Armstrong, an expert on North Korea at Columbia University, stated that "although high-ranking leaders, including members of the Kim family, have been deposed before, we haven't seen anything this public or dramatic since Kim Jong-un's grandfather Kim Il-sung purged his last major rivals in the late 1950s. This seems to indicate the divisions within the Kim regime were more serious than previously thought." Former U.S. National Security Council director for Asian affairs Victor Cha said that the purge and execution of Jang "tells you that everything's not normal ... When you take out Jang, you're not taking out just one person – you're taking out scores if not hundreds of other people in the system. It's got to have some ripple effect." On the other hand, some analysts suggested that Jang's influence and role had been exaggerated. Professor Chung-in Moon from Yonsei University noted that there had been no policy shifts in the North Korean government and that some of Jang's closest associates, including Pak Pong-ju and Kang Sok-ju, had kept their positions. He also noted that Kim Jong-un's cabinet continued to emphasize economic incentive systems, innovation, and economic cooperation with China. Professor Chung-in said that "He [Jang] could, therefore, have been purged and executed because of his obsession with material and organizational interests that challenged Kim Jong Un's reform initiative to streamline the country's economic management. If this turns out to be true, then Kim Jong Un should be seen as a reformer, whilst Jang was a reactionary." In another analysis he stressed that Jang's removal had not weakened the government, which was actually more stable than before: "The politics of extensive surveillance, control, fear and intimidation are still alive and well. The party, the state, the military and security apparatus remain committed, effective and unified in purpose. The dramatic episode of Jang's downfall has created a formidable deterrent to any potential or actual opposing groups." Following Jang's fall, experts speculated that purges of other top figures might follow. An anonymous source said Ji Jae-ryong, North Korean ambassador to China and a close associate of Jang, "will eventually be dealt with"; however South Korean diplomatic sources said it was "business as usual" at that embassy. In early December, Pyongyang recalled two ambassadors: from Malaysia Jang's nephew Jang Yong-chol, from Cuba Jang's brother-in-law Jon Yong-jin. Deputy tourism minister Jo Sung-goyu, another Jang relative, canceled a planned trip to a tourism summit in Kaohsiung, Taiwan. The public received word of Jang's dismissal in the Rodong Sinmun on 12 December and were called to meetings to denounce Jang and pledge loyalty to Kim. Two days later, on 14 December, the Korean Central News Agency (KCNA) released a roster of six top officials appointed to a national committee in charge of organizing a state funeral for Kim Kuk-tae (a former Workers' Party official who recently died). The roster included the names of Jang's widow (Kim Jong-un's aunt), Kim Kyong-hui, and vice-premier, Ro Du-chol, indicating both survived the purge and remained in favor. KCNA and Rodong Sinmun began erasing references to Jang "as completely as possible", deleting some 100,000 and 20,000 news items from their websites, respectively. The status of Kim Kyong-hui's relationship with Jang had been a subject of frequent speculation. Analysts believe that Jang and Kim Kyong-hui had been estranged. Yoon Sang-hyun, a National Assembly of South Korea deputy floor leader of the governing Saenuri Party, had said previously that Kim had been "separated" from Jang and did not oppose his purge. Following the execution, Chosun Ilbo reported that Choe Ryong-hae may now be the "number 2 man" in North Korea. The South Korean newspaper reported claims that Kim Jong-il "asked Choe on his deathbed to help his son Jong-un" but that the North Korean military disapproves of Choe. In January 2014, the South Korean Yonhap News Agency reported that the purge had extended to Jang's family, with all his relatives, including children, being rounded up and executed. According to a South Korean newspaper, Jang's nephew, O Sang-hon, was executed by being burnt alive with a flame thrower. South Korea – The Yonhap News Agency reported that South Korea held a security ministers' meeting to discuss the North Korean situation. Kim Jang-soo chaired the meeting. Earlier in the week, the South Korean president Park Geun-hye told a Cabinet meeting that "North Korea is now engaged in a reign of terror while carrying out a massive purge" to consolidate Kim Jong-un's power. The unification ministry issued a statement saying that: "The government has deep concerns about a recent series of developments in North Korea and is watching the situation closely." South Korean defense chief minister Kim Kwan-jin told a parliamentary defense meeting on 13 December: "We will heighten readiness against North Korea as (Jang's execution) can lead to provocations against the South. This case can be seen as part of the reign of terror by Kim Jong-Un as he is seeking to consolidate his power with an iron fist." China – Following the reports of Jang's death, the Chinese foreign ministry stated only that the fall of Jang was a "domestic issue", but reports indicated that "China's North Korea experts have been working furiously to come up with [a] consensus" about the resulting implications. Chinese foreign minister Wang Yi stated that China is observing the situation, but that it does not expect major shifts in North Korean policies. Japan – Chief cabinet secretary Yoshihide Suga told the Kyodo News agency that the Japanese government was "closely watching the situation" and that "We will calmly monitor the situation while communicating with other countries and collect relevant information." Sweden – Swedish foreign minister Carl Bildt condemned the execution as "Stalinist" and stated: "I think that what we see now publicly is only the surface of an empire of horror." United Kingdom – Prime minister David Cameron's official spokesman told reporters at a daily press briefing: "If this is confirmed, it is another example of the extreme brutality of the North Korean regime." Hugo Swire, minister of state at the Foreign Office, said: "We are deeply concerned to learn of the execution. This is another example of the brutality of the North Korean government, and we have consistently raised concerns about severe and systematic human rights abuses. The UN is currently running a commission of inquiry and it is quite right that we do everything we can to investigate North Korea's appalling human rights record. More broadly, we remain deeply concerned about the impact of this unpredictable regime on stability in the region. Our embassy in Pyongyang is monitoring the situation closely and we will continue to maintain close contact with our allies on this." Lord Alton of Liverpool, chair of the North Korea All-Party Parliamentary Group, said Jang "represented for many the real hope for reform in North Korea" and stated that Jang's execution was a "bloody and vivid and brutal reminder of the inherent and cruel nature of a regime that has always modelled itself on Stalin's USSR" and its gulag system. United States – State Department deputy spokeswoman Marie Harf told the media on 12 December 2013: "While we cannot independently verify this development, we have no reason to doubt the official KCNA report that Jang Song Thaek has been executed. If confirmed, this is another example of the extreme brutality of the North Korean regime." The following day, at the State Department's press briefing, Harf stated that "we would urge the North Koreans not to take provocative acts, not to do so going forward, because it's not in the interest of regional stability". Patrick Ventrell, deputy spokesman for the White House National Security Council, told the Yonhap News Agency that, "if confirmed, this is another example of the extreme brutality of the North Korean regime... We are following developments in North Korea closely and consulting with our allies and partners in the region." Secretary of State John F. Kerry stated in an interview broadcast on ABC's This Week on 15 December that Jang's fate "tells us a lot about … how ruthless and reckless" and "insecure" Kim Jong-un is, and described Kim as "spontaneous, erratic, still worried about his place in the power structure and maneuvering to eliminate" potential competitors. Kerry stated that Kim leads a "ruthless, horrendous dictatorship" and Kerry urged the denuclearization of North Korea. Senator John McCain, member of the Senate Foreign Relations Committee, said of Kim on CNN's State of the Union: "I think it's very obvious this young man is capable of some very aberrational behavior, and given the toys that he has, I think it's very dangerous. You would think that the Chinese would understand that, as well. They've got to rein this young man in—and they can." United Nations – Secretary-General of the United Nations Ban Ki-moon, formerly the South Korean foreign minister, stated on 16 December that he found reports of the execution to be "very dramatic and surprising" and appealed for calm, stating: "At this time, I would appeal to all the parties concerned, surrounding the Korean Peninsula, while they must be vigilantly and carefully watching the development of situation, not to take any premature actions. I do not hope that because of that there will be some increase of tensions on the Korean Peninsula." Ban stated: "The period ahead should be used to build confidence in the international community and to improve living conditions for the country's long-suffering people. I stand ready to offer my good offices." Ban reiterated the United Nations' longstanding stance against capital punishment "under any circumstances" and urged North Korea to comply with Security Council resolutions, which North Korea has frequently flouted. ^ "N. Korean media confirm leader's uncle Jang Song Thaek ousted", upi.com, 8 December 2013; accessed 13 December 2013. ^ Jang's exact birthdate is unclear. The North Korea Strategic Information Service Center reports his birthdate as 22 January 1946 (see "Volume 2: Jang Song Thaek's background and his estimated power". Archived from the original on 20 December 2013. Retrieved 2013-12-19. CS1 maint: BOT: original-url status unknown (link), North Korea Strategic Information Service Center, 12 December 2013.) Cheong Seong Chang of the Sejong Institute also cites the same date. Cheong Seong Chang, The Rise and Rise of Mr. Jang, DailyNK, 7 February 2013. An April 2013 report from the official Korean Central News Agency also cites 22 January 1946 date. Brief History of Member of Presidium, Members and Alternate Members of Political Bureau of C.C. Archived 25 June 2013 at the Wayback Machine, WPK Elected to Fill Vacancies, Korean Central News Agency, 11 April 2012. However "until KCNA published an official biography upon his election to NDC Vice Chairman in June 2010, Chang's birthday has been reported as 2 February 1946 and 6 February 1946". Jang Song Taek, North Korean Leadership Watch. ^ a b c 장성택(張成澤) (in Korean). Information Center on North Korea, Ministry of Unification, Republic of Korea. Retrieved 20 August 2007. ^ a b "North Korean media confirms promotion of Jang Song-thaek to senior post". Yonhap News. 13 December 2007. Retrieved 3 January 2008. ^ Ben Webster (8 November 2008). "North Korea 'is being run by Kim Jong Il's brother-in-law'". The Times. London. Retrieved 8 November 2008. ^ a b Choe, Sang-hun (7 June 2010). "N. Korea Reshuffle Seen as Part of Succession Plan". New York Times. ^ Andrew Salmon; David Blair (28 December 2011). "Kim Jong-il funeral: Kim Jong-un steps up as nation mourns". Daily Telegraph. London. Retrieved 28 December 2011. ^ "North Korea May Take Action to Jolt Economy, Analysts Say". The New York Times. 5 September 2012. Retrieved 9 January 2013. ^ "Der retuschierte Onkel". Der Spiegel. Hamburg. 10 December 2013. Retrieved 10 December 2013. ^ a b "North Korea executes Kim Jong Un's uncle". Associated Press. 12 December 2013. Retrieved 12 December 2013. ^ a b "All relatives of Kim Jong-un's uncle executed too: report". Sina. 2014-01-26. ^ a b "All relatives of Jang executed too: sources". Yonhap. 2014-01-26. ^ a b c d e f g James E. Hoare, Jang Seong-taek, Woodrow Wilson International Center for Scholars. ^ Yi, Yeong-jong (18 September 2006). "파리의 김정일 조카 장금송 비운의 러브스토리 (Unlucky love story of Kim Jong-il's niece in Paris)". JoongAng Ilbo (in Korean). Archived from the original on 3 March 2016. Retrieved 30 May 2007. ^ Petras, George (2016-02-10). "North Korea executions under Kim Jong Un". USA TODAY. Retrieved 4 February 2017. ^ Associated Press, "Leader's Uncle Rose To No. 2 In North Korea", 13 December 2013. ^ Jang Song Taek, North Korea Leadership Watch. ^ a b Profile: Chang Song-thaek, BBC News (12 December 2013). ^ Demick, Barbara (4 December 2004). "Kim Jong-il purges relative from power, paving way for sons". The Seattle Times. Archived from the original on 29 September 2007. Retrieved 20 August 2007. ^ a b Ashish Kumar Sen (26 September 2010). "Kim's heir apparent set for debut in Pyongyang". The Washington Times. Retrieved 13 December 2013. ^ James A. Lyons (22 April 2013). "The right response to North Korea". The Washington Times. Retrieved 13 December 2013. ^ Sam Kim. "N. Korean leader shows up at parliament, shakes up posts: report". Yonhap News Agency. Retrieved 7 June 2010. ^ "North Korean power-behind-throne emerges as neighbors meet". Reuters. 25 December 2011. ^ "President Hu Jintao Meets with DPRK Delegation of the Joint Steering Committee for Developing Two Economic Zones". Embassy of China in the USA. 17 August 2012. ^ a b c d "Wen Jiabao Meets with DPRK Delegation of the Joint Steering Committee for Developing Two Economic Zones". Chinese embassy in the USA. 17 August 2012. ^ Nathan Beauchamp-Mustafaga, "Show Me the Money: Evaluating Jang Song-thaek’s Search for Economic Cooperation in Beijing," Sino-NK, 19 August 2012. ^ "Report on Enlarged Meeting of Political Bureau of WPK Central Committee". Korean Central News Agency. 4 November 2012. Archived from the original on 13 December 2013. ^ a b c d e f Alexandre Mansourov, "North Korea: The Dramatic Fall of Jang Song Thaek", U.S.-Korea Institute at SAIS, 9 December 2013. ^ "JST on Political Bureau Presidium?". North Korea Leadership Watch. 8 January 2013. Retrieved 9 January 2013. ^ Alexandre Mansourov (17 December 2012). "A Dynamically Stable Regime". 38 North. ^ Cathcart, Adam (9 December 2013). "Blind Legacy: Jang Song-taek and North Korea's Invisible Cross-Border Bridge". Sino-NK. Retrieved 4 January 2014. ^ Choe Sang-Hun, David E. Sanger (23 December 2013). "Korea Execution Is Tied to Clash Over Businesses". New York Times. ^ "North Korean leader's uncle likely removed from power: spy agency". Yonhap. South Korea. 3 December 2013. ^ Horowitz, Alana (24 December 2013). "Jang Song-thaek's Aides Executed With Antiaircraft Machine Guns: Report". Huffington Post. ^ Where Is Kim Jong-un?, Chosun, 6 December 2013. ^ N Korea film 'edits out dismissed uncle Chang Song-thaek', BBC, 6 December 2013; accessed 13 December 2013. ^ "North Korean leader's powerful uncle dismissed – Seoul media". Reuters. 3 December 2013. ^ a b Foster-Carter, Aidan (9 December 2013). "Family affair: Kim Jong Un wipes his uncle from North Korea's history". The Guardian. Retrieved 10 December 2013. ^ "Report on Enlarged Meeting of Political Bureau of Central Committee of WPK". Korean Central News Agency. North Korea. 8 December 2013. Archived from the original on 4 March 2017. Retrieved 8 December 2013. ^ a b Want China News, "Kim Jong-un's brother led arrest of Jang Sung-taek: source" Archived 14 December 2013 at the Wayback Machine, 12 December 2013. ^ Zachary Keck and Ankit Panda, "North Korea Executes Leader's Uncle", The Diplomat, 13 December 2013. ^ a b c d e f Alexandre Mansourov, "North Korea: What Jang's Execution Means for the Future", 38north.org; 13 December 2013. ^ "North Korea Says Kim's Uncle Executed", The New York Times, 12 December 2013. ^ Yonhap News Agency, "N. Korea executes leader's uncle for 'treason': KCNA", 13 December 2013. ^ a b c Choe Sang-hun, "Grasping for Clues in North Korean Execution", New York Times, 14 December 2013; accessed 4 January 2014. ^ "Jang's fall won't exert significant influence on East Asian dynamics", Global Times, 9 December 2013. ^ a b c Ed Flanagan, "Execution of Kim Jong Un's uncle recalls grandfather's lethal era", NBC News, 13 December 2013. ^ Rose Kim, "Execution sign of a regime on the edge", Sydney Morning Herald, 13 December 2013. ^ a b "Is Kim Jong Un The Reformer, And The Executed Uncle Jang Seong-Taek The Reactionary?". Huffington Post. 23 January 2014. Retrieved 3 May 2014. ^ "Shocking, But Not a Game Changer: Unraveling Regime Dynamics in Post-Jang North Korea". 38north. 24 February 2014. Retrieved 3 May 2014. ^ N.Korean Ambassador to China Likely for the Chop, Chosun Ilbo, 11 December 2013. ^ "'Business as usual' for N. Korean ambassador to China: source" Archived 20 December 2013 at the Wayback Machine, Yonhap News Agency, 9 December 2013. ^ Barbara Demick and Jung-Yoon Choi, "North Korean ouster could bring more political turmoil", Los Angeles Times, 9 December 2013. ^ CNA N. Korean tourism official cancels Taiwan visit plans (13 December 2013). ^ "Workers in Public Loyalty Pledge", DailyNK, 12 December 2013. ^ a b c d e f Choe Sang-hun, "Kim Jong-un's Aunt Appears to Survive Husband's Purge", The New York Times, 15 December 2013. ^ "Is Choe Ryong-hae Now N.Korea's Most Powerful Man? ", Chosun Ilbo, 19 December 2013. ^ Julian Ryall (7 April 2014). "North Korean official 'executed by flame-thrower'". The Daily Telegraph. ^ "N.Korea Shuts Down Jang Song-taek's Department". Chosun Ilbo. 7 April 2014. ^ "North Korean Leader Kim Jong Un's Uncle Executed: Report", Radio Free Asia, 12 December 2013. ^ a b c Damien McElroy, 'Empire of horror' North Korea faces worldwide condemnation for execution, Telegraph, 13 December 2013. ^ a b AFP, US warns N. Korea against provocation following execution, 14 December 2013. ^ "China watching North Korea for impact of execution of Kim's uncle". South China Morning Post. 16 December 2013. ^ International concern over N Korea execution, Al Jazeera, 13 December 2013. ^ Execution 'shows extreme brutality', Belfast Telegraph, 13 December 2013; accessed 4 January 2014. ^ Jonathan Cheng, "North Korea Says Uncle of Kim Jong Un Executed: Jang Song Thaek Was Until Recently the Country's De Facto No. 2 Ruler", Wall Street Journal, 12 December 2013. ^ Chad O'Carroll, "North Korea executes ‘traitor’ Jang Song Thaek", NK News; accessed 4 January 2014. ^ "U.N. chief cautions against 'premature actions' on N. Korea", Yonhap News Agency, 17 December 2013. ^ Associated Press, "Ban Ki Moon says N Korea execution was a dramatic surprise", 17 December 2013.